Clawfoot bathtubs. Those two words summon such lovely images to mind. 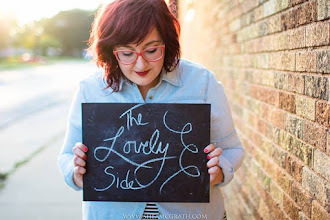 These vintage beauties stem from my deep-rooted love of all things Victorian. And it is with great pleasure that I can say my new apartment has one in its bathroom. You can bet that one of first things I do after moving in will be filling that clawfoot tub with bubble bath and sinking in with a good book and perhaps a glass of mead. I am so excited. I don't have photos of my new place yet. (Someone is still living there through the end of the month.) So I rounded up ten gorgeous clawfoot tubs to inspire my decorating ideas and to whet your appetite until the day I get to share mine. :) Enjoy! I love the rustic cottage feel of this one. 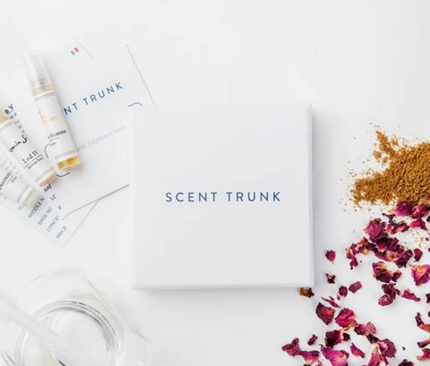 The shelves keep essentials like towels, candles, and bubble bath within easy reach. And the primitive little stool is an adorable offset to the tub's lovely curves. This is very similar to what my tub looks like—black base, white interior. Mine also has a metal fixture that includes a shower head. 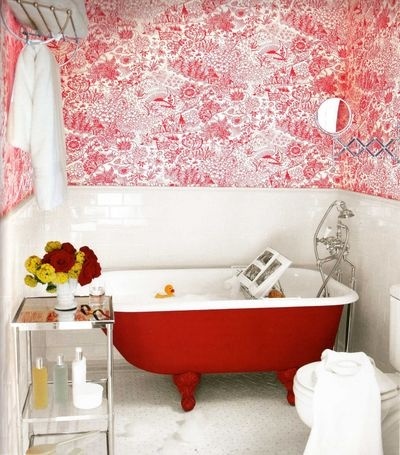 I love the fresh, floral, femininity in this bathroom. 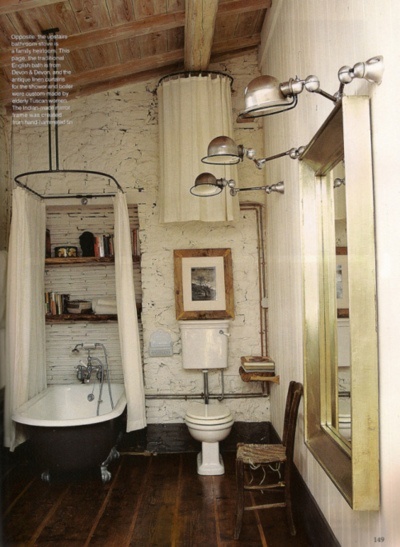 And here's another tub like mine, but in a more rustic setting. The hardwood floors and white painted brick in this space makes me swoon—especially with details like rustic shelving and the exposed pipes. It's cozy and industrial at the same time. Oh, oh, oh. 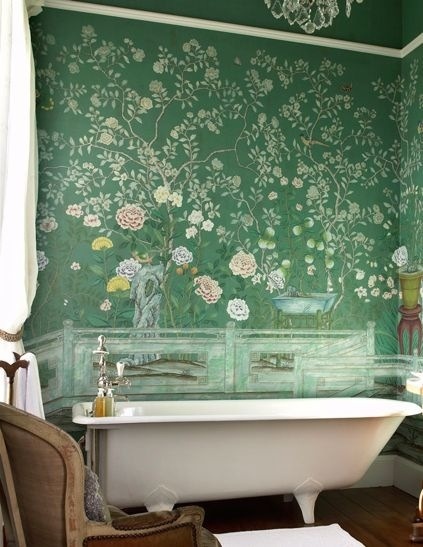 I LOVE the mural in this bathroom. It is reminiscent of ancient murals found in the buried villas of Pompeii. So pretty. The shade of faded emerald is gorgeous, too. It couldn't get more perfect. I love everything about this bathroom. The handsome hardwood floors, the radiator, and the natural light pouring in through the window catching the metallic gleam on the sink, bathtub, and shelves. Understated and absolutely lovely. This bathroom is cute! The authentic black and white vintage tiling caught my attention from the get-go. I love the long, skinny shelves lined with candles and what look to be glass jars filled with seashells. The splashes of color in here are lovely, too: hot pink, mustard, pale turquoise, orange. 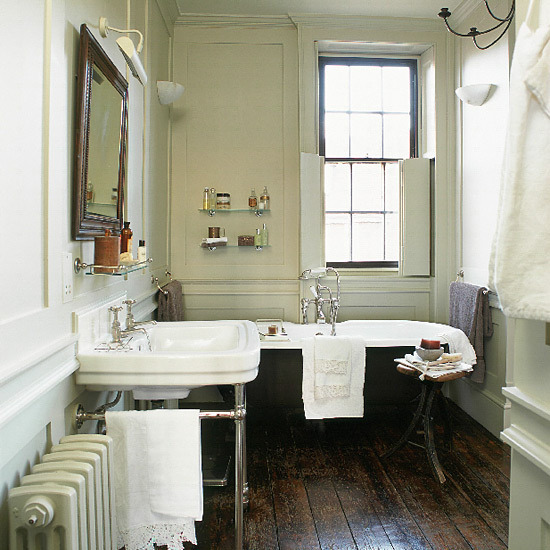 Simple can go a long way in letting the vintage character of a place speak for itself. 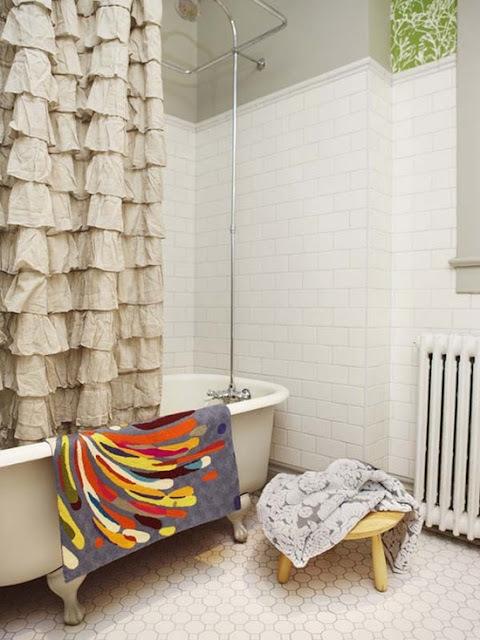 The radiator, vintage subway tiling, and clawfoot tub take center stage here. 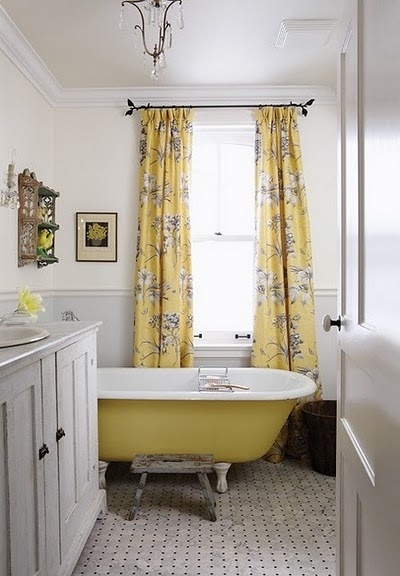 I love how the ruffled shower curtain softens the space with a feminine touch. The little round stool is perfect. 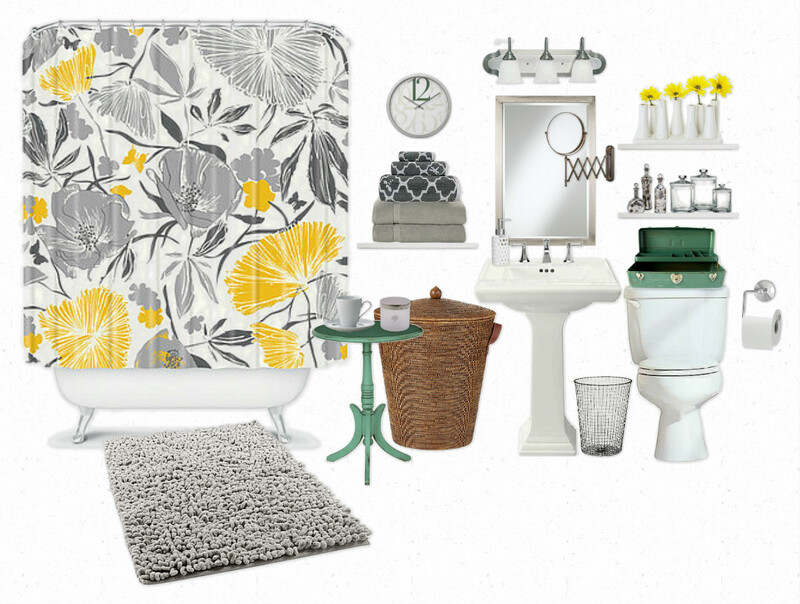 And the pop of green wallpaper at the top right is such a pretty little surprise of pattern. 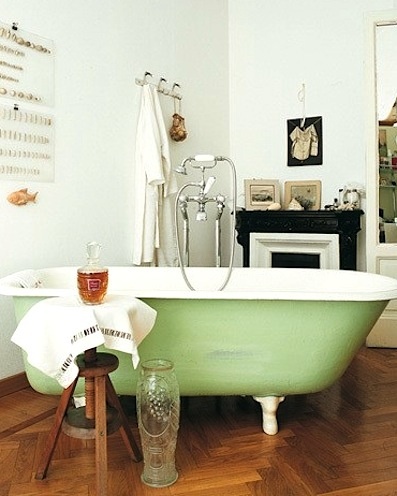 Ooooh, I'm loving the vintage vibes surrounding this green clawfoot tub. The stool, glass bottles, and diagram artwork feel apothecary chic. I saved this one for last because it contains some of the same hues I'll be putting to use in my bathroom decor: white, gray, and yellow. When I created the above Olioboard as an inspiration board for decorating my future apartment bathroom using the shower curtain and accessories I already have... throwing in the clawfoot tub was really just wishful thinking. I can hardly believe that I'm actually going to have a clawfoot tub! So spill. Which of you lovely readers have lived with and enjoyed a clawfoot tub? :) I'm in for a treat, right?